As the weather continues to warm up, this arrangement is a great way to lift a loved one's spirits and get into the spring of swing. 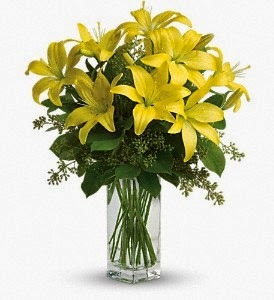 Our Lily Sunshine bouquet makes for a perfect spring flower arrangement. It features bright shades of yellow, giving it a vibrant appearance in any setting within your home or apartment. This arrangement is a lovely assortment of Asiatic Lilies, seeded Eucalyptus and Salal, and it's always a popular choice amongst Bloomex's customers. IDEAL FOR: Spring flowers, 'thinking of you', get well soon.